I have seen this recipe for Restaurant Style Salsa on a bunch of different blogs. I've never given it a try because it calls for Rotel and you can't get Rotel in Canada. One weekend my brother was heading to the States with his family so I asked him to pick some up for me. 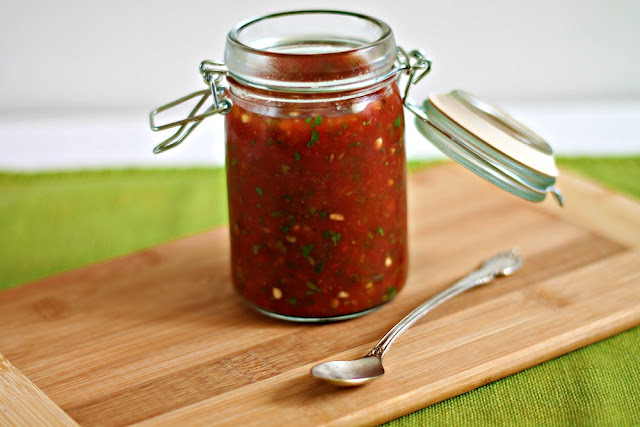 This salsa is extremely quick to make and tastes great. I used it in some Spicy Bean Burritos. I also made some Baked Garlic Pita Chips and we dipped them in the salsa. If you can't get Rotel, substitute 1 14 oz can of tomatoes and 1 can of green chillies for the Rotel. I haven't tried this but I've read online that it's a good substitution. most recipes for this salsa that I saw makes a huge batch. This recipe I got from Mountain Mama Cooks and it made a reasonable amount. Add all the ingredients to a food processor and pulse till desired consistency. Taste and adjust seasonings as desired. Store unused salsa in fridge. Home made salsa? ?Very flavorful n lovely!! Asi, I love the pic! Did you take this? Amazing job! I love the simplicity of it! Thanks for the substitution tip! I will definitely be making this! Salsa looks so spicy n flavorful, sounds so yummy. What a colour! Looks Delicious. Never tried making salsa at home.....might give it a try now with this recipe. Your pics are getting better and better with each post , mashallah. Jazakallah Sadaf...I am an amateur but slowly learning. Have a long way to go but it's a fun hobby! This salsa looks lovely. I like the idea of using honey. I've never tried that before. YEAH!! I"m so glad it turned out well. Please do let me know when you make it so I can share on my Facebook page as well. I also have a recipe for baked pita chips on my blog that are really easy to make too!